The brand new visitor centre, interpreting the Battle of Bannockburn, will satisfy every question, about the momentous events of 23-24 June 1314, when it opens later this year. It is 50 years since the old visitor centre opened, to join the great flagpole, put up in 1870 to enable people to find the site. For 500 years before that, there was nothing to indicate the site except the Borestone, the stone in which king Robert the Bruce was said to have planted his standard. 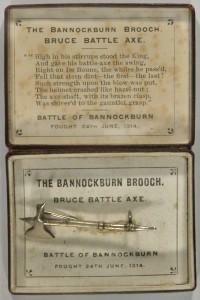 Yet the cry, ‘Remember Bannockburn!’ has rung down the centuries, the Bannockburn 700 exhibition at the Smith will chart how this has been done.